should arrive a half a day ahead of us. We have the mizzen spinnaker flying which is red, white and blue. sail. There were a zillion stars out last night and it was gorgeaus. hot dinners ready every night. we like to try to go at least 6 knots if possible. morning to give us weather updates), Horizon, and Key of D.
after us, but we have not been able to hear their SSB broadcasts yet. We expect to leave for Fiji tomorrow morning (Wednesday, May 28) about 10 am local time. (That is May 27 at 2200 UTC). It has been raining torrentially all day but there should only be scattered showers when we leave. The forecast is good, although after about 4 days forecasts are not very reliable. We may stop at Minerva Reef, about 780 miles away and a bit to the east of the rhumb line to Lautoka, Fiji, if we need to rest and reassess the weather. 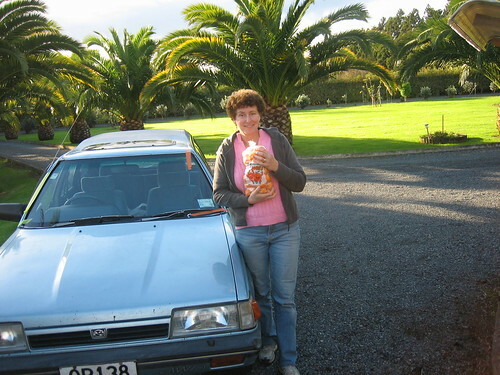 Yesterday the weather was nice so we borrowed Risho Maru’s old Subaru from it’s news owners, Dieter and Renata of “Symi”,and drove to the town of Kerikeri. 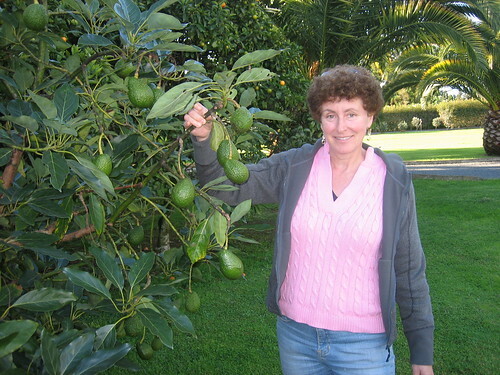 Kerikeri is in the middle of a major fruit growing area — kiwis, mandarin oranges, avocado, persimmons. Walking through town we saw a little sign for the Cafe Jerusalem in English and Hebrew. We stopped for lunch and Laura spoke Hebrew to the two proprietors, both young men from Israel. 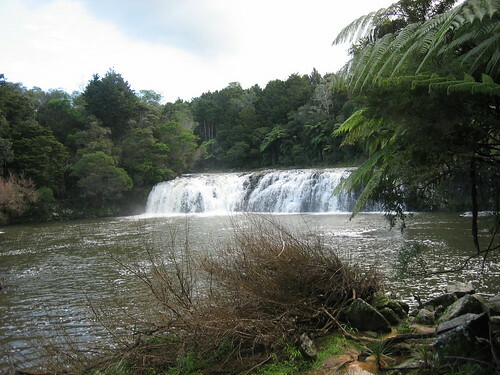 We then hiked up to a small waterfall on the Kerikeri river and stopped for flat whites (expresso coffee with steamed milk) and a chocolate slice (brownie) at a little place on the river. — M.
We posted a short video of New Zealand on our blog. Take a look at the “Photos and Videos” page and scroll half way down the page to see a link to a video of us in New Zealand. If you watch it you will see almost as much of New Zealand as we have seen so far. We are kind of tied down to the boat here – awaiting a weather window that just doesn’t want to come. First it was too rough and now the forcast is for almost no wind at all – plus lots of rain. We thought we were leaving tomorrow (Sunday), but have revised our plans to wait a few more days. We will see what the morning brings. In the meantime we are enjoying things at Opua Marine. Just went out to dinner with our new friends Gloria and Willi from the greatly named boat “Linger Longer”…. We may go to the weekly market in Keri Keri in the morning. It is supposed to be great – although, to tell the truth, I don’t think there is a single thing we need or want to buy at this point. We are full up with supplies. We have been in Opua for 5 days now, after aborting our initial effort to sail to Fiji. We have been keeping tabs on our friends Risho Maru and Vera – via e-mail and SSB radio reports – to track their progress – as they head towards New Caledonia and Fiji respectively. Risho Maru left here a few days before we did in what was expected to be a “perfect weather window”, but it apparently was nothing perfect at all – they had a few days of too little wind ( and their boat carries a tiny engine and very little fuel, so they have to try to sail no matter how slow it is) – followed by 4 days of very high winds coming right on the nose – making for a wet and difficult sail up to New Caledonia. They had to heave to one night – meaning they turn their jib so that it is actually facing the wrong way into the wind (backwind), but leave their mainsail in the correct position – and lash the wheel in one direction. By doing this you prevent forward movement of the boat by balancing rudder and sail (although in the ocean of course you never stay in one postion). It is what you have to do when the wind is too strong (in the wrong direction) to allow you to follow your course . We have never done it, but probably will at some point. It is a nice manoeuver to do to allow you to get some rest and stop smashing through the rough seas. They have reached New Caledonia and we are very glad to hear it. Our friends on Vera are having an even more difficult experience. Just a day after we separated at sea with us turning back to New Zealand, and they deciding to continue on to Fiji, their autopilot failed. The autopilot is one of the most important “comfort” features on modern boats – it allows you to set and follow a course without having to hand-steer the boat. This lets you basically sit back and rest and watch and listen while you sail, always watching for changes in wind direction, but allowing you to make adjustments in boat direction by just pushing a button occasionally. You don’t have to handle the steering wheel and continually watch the compass which can be tiring after a few hours- and extremely exhausting after a few days. It is especially difficult when it is dark – and it is dark from 6:00 P.M through 6:30 a.m here. Without their autopilot Michael and Britta have to take turns steering which means that no-one can really sleep more than a couple of hours at a time. They can not fix the autopilot while at sea because they are missing the spare parts for it. We will be bringing them the parts they need – but of course we can do nothing until we meet up with them in Fiji. After 4 days of hand-steering through very rough seas and lots of rain and wind they just arrived at Minerva Reef – a famous spot just a few hundred miles from Fiji – that has a shallow lagoon protected from the open ocean by just a coral reef. Sailers sometimes stop there for a few days, dropping their anchors and resting. For the Veras it must be an incredible relief to be able to drop their anchor and close their eyes and have a good long sleep without worrying about steering the boat. They will have another 2 to 3 day sail to arrive in Fiji. So, after all that, we have been very contented to be here at the nice dock in Opua arranging the boat as best as we can in order to have a comfortable passage. We will be better prepared both mentally and physically when we set out again – possibly as early as this week-end. Today is the first day since we arrived in New Zealand that we have been able to relax. We slept 11 hours and lazed around the boat in the morning. In the afternoon, we took a walk along the cliffside trail to Pahia. The weather forecast suggests that we may be here at least through next weekend. 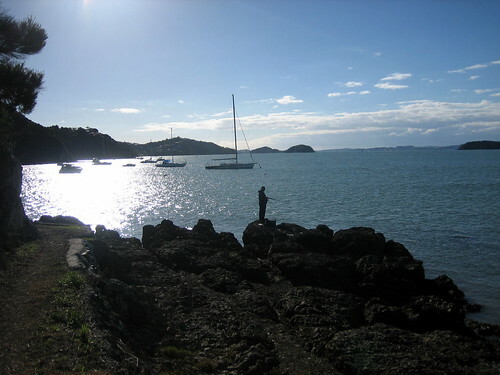 Fisherman on the shore of the Bay of Islands, Opua. 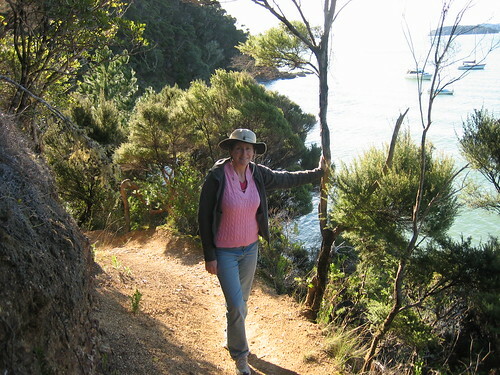 I am writing this while Sabbatical III is berthed at the Opua Marina in Opua, New Zealand. At the time that we sent the previous blog entry giving our position after almost a day of sailing to Fiji, we also downloaded some weather information. The new GRIB weather files now showed an area of rapidly developing low pressure in the Tasman Sea that was predicted to move north and east across our route. This storm system was predicted to come with 40 knots of wind, much of it from unpleasant directions, high seas, and lots of rain. Conditions like this would not put us at great risk, but they would make for a few unpleasant days. We called Vera on the sat phone to discuss the new forecast, which they had also just seen. Michael suggested that deviating to the east should reduce the force of the weather system. The problem was that for the previous few hours the wind had moved a bit north and strengthened so that we could not sail our course and were going further west than we would like. The wind was supposed to be southeast, which would allow to sail east a bit, but it was ENE, which did not allow any easting. We were sailing as close to the wind as we could, which made the boat heel and brought waves over the bow. We were making very good time, however, and were already 160 miles out from Whangarei. This all seemed very much like the trip from Tonga to New Zealand in November. That passage, with a run-in with an unexpected low pressure system, was the most difficult of our voyage so far and one we wished to avoid. So we talked it over and decided to turn around and head back to New Zealand. Vera considered doing so as well, but in the end they decided to continue on to Minerva Reef. They are better placed to get away from this system than us. They started out for Minerva, which is east of the direct passage to Fiji, so were further east when the new forecast arrived. In addition, as a Nautor Swan, a boat built for racing, Vera could sail faster and closer to the wind than Sabbatical III. We just spoke with them on the sat phone and they are making very good time. They expect to arrive at North Minerva about the same time as this weather sytem, so they need to push the boat. Once inside the reef they should be safe and able to rest. Rather than return to Whangarei, we made for Opua, which is about 50 miles closer. We arrived this morning at 11 am and re-checked-in to New Zealand. We just looked at GRIB files going out 7 days and found that a second low pressure system, possibly even more intense than the one that induced us to turn back, will be following. So we will be in Opua for a least one week. The German weather guru Willifred is just one dock down from us so we have a good source of weather forecasting to turn to rather that just rely on the GRIB files. The bright spot of this 40 hour passage into the South Pacific and back was the performance of the AIS (Automatic Identification System) receiver that I bought in the US and brought back in our luggage. It receives and translates messages send by transponders carried by all commercial ocean-going vessels above a minimum size. I have the AIS data stream fed into a laptop at the nav station. I also was able to get GPS, wind, and depth data converted from our Raymarine Seatalk network, which is proprietary, to the open NMEA standard and also got that fed into the laptop. Using Boatcruiser 2.0 software, I set an AIS alarm range and hooked up a cheap USB speaker in the cockpit to sound an alarm that is easily heard in high winds or with I-Pod headphones on. 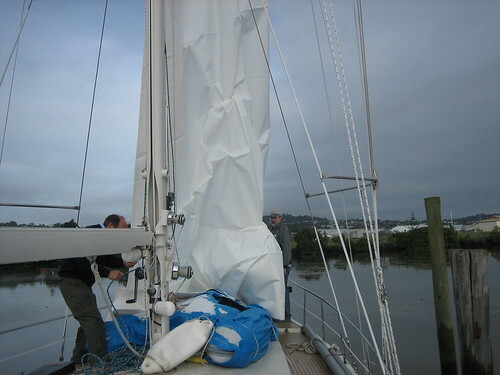 The test was the night sail up the east coast of the North Island on Thursday night. The AIS picked up vessels 30 miles away that were othewise invisible. For example, at about 10 pm the laptop beeped and flashed the approach from astern of Forum Fiji II, a cargo ship bound, as we were, for Lautoka, Fiji. Only 30 minutes later, it indicated that Pacific Alliance was approaching from dead ahead. The AIS system provides us with basic data from the GPS of the transmitting vessel. For example, the AIS provided our laptop with the name of the other vessel (Pacific Alliance), it length (800 feet! ), its beam (138 feet wide), draft (45 feet deep), its type (oil tanker), destination (Whangerai), speed (17.4 knots), call sign, distance (25.8 miles), closest point of approach to Sabbatical III (less than 0.1 mile), time to closest point of approach (1 hour 8 minutes), rate of turn (0 degrees), course over ground, bearing, etc. We get to see the instruments of the Pacific Alliance on our boat since their AIS transponder transmits it to us. Our laptop combines the other vessel’s GPS data with our GPS data to compute closest point of appoach and time to closest point of approach. We often do not see another vessel with our eyes until they are 5 miles away and then it would take some time to figure out if they were heading towards us. With the AIS, we saw the Pacific Alliance coming right for us but we had over an hour to get out of the way. The AIS also showed the 380 foot cargo ship Forum Fiji II coming up behind us and to starboard. Knowing this, we turned a few degrees to port, thus getting out of the way of a supertanker but without crossing the path of a fast moving cargo ship. All this without either of the two ships being within eyeball or radar range. In the end, the tanker never deviated course (we saw them on AIS well before they ever noticed us) and we passed 3 miles apart. Ray Roberts and his son Carl. Ray owns and operates the Riverside Drive Marina in Whangarei, where we kept our boat for the season. We are back on dry land now after a brief foray into the open ocean. After a hectic week of preparation we felt ready to go to Fiji – and left on Thursday – just 8 days after arriving in New Zealand. The “perfect weather window” that everyone had been talking about here had many cruisers leaving the docks last week-end (around the 10th of May). There was a great forcast for sailers making the trip from New Zealand to either Fiji, New Caledonia or Vanuata . Even though we managed to get everything ready for our trip in an amazingly short amount of time, we really were just a day or two late in setting out from New Zealand in time to catch the optimal weather patterns. Just a day out to sea, we read (via downloaded weather maps and e-mails) that the system was changing rapidly and we could expect quite a lot of wind and rough seas for the week ahead of us. We just weren’t up to facing that and turned the boat around about 100 miles north of New Zealand and spent the night sailing back to safe harbor in Opua where we will await the next good weather window. Mark has written a bit about that already, so let me fill you in on what we did in our week in New Zealand to get ready for departure. The main excitement was seeing old friends. We were happy to find our friends Michael and Britta from “Vera” in Whangarei with us . Although their boat was down the road from us in a different marina, it was easy to get together, although we both spent most of our days doing boat chores . We somehow managed to go out to dinner with them 4 times. We met a very nice couple whom we had briefly known in Tonga and who had become good friends with Vera over the winter – they are Beth and Ken – two Americans- on board their boat Eagles Wings. The six of us went out to dinner a couple of times. Beth and Ken have spent the past 3 years going back and forth between New Zealand and Tonga and are doing it again this year. We had been anxiously awaiting our reunion with Risho Maru, the Austrian couple we befriended last year. 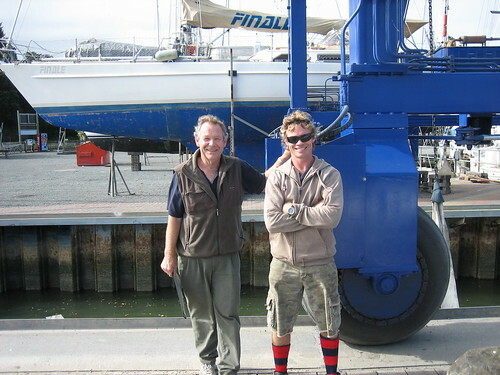 They have been in New Zealand since we left – working on their boat and touring the country. It was almost a week after our arrival that we were able to see them – as their boat is in a marina about an hour drive north of ours – but on Monday they drove down to see us. It was a bittersweet reunion as they have decided to start heading home – and will not be going to the same places as we are. They just don’t have the time. They want to get their son Finn enrolled in a real school – rather than continuing with his “boat schooling” – and they are somewhat anxious to return to loved ones at home -after being away for 3 years already. It will still take them a year and a half to get back to Europe, but that means moving relatively quickly through the rest of the South Pacific and hopefully arriving in Thailand by November – a long distance away – and then the Med by May. They will not be going to Fiji with us as we had hoped. Right now they are on route to New Caledonia and then they will go to Vanuatu before heading west. We, on the other hand are going first to Fiji, and then to Vanuatu. It is not easy (from a sailing perspective) to go the opposite direction – otherwise we would seriously consider it. However, if things go right we will be able to meet them once again in Vanuatu for a short time before they leave – we certainly hope so. We are so very disappointed and sad to see them go…… I guess it is something we have to continue to get used to as we meet new people around the world. Provisioning took up a huge amount of time (and money!) – as we made several large shopping expeditions – filling the boat with canned goods, drinks, sweets, cheeses, meats, sugar, flour…. etc. etc. Luckily there are great grocery stores here – everything one could want is available – although the prices here are absurdly high especially with the bad exchange rate for U.S. dollars. My favorite store was “The Mad Butcher” – which is named quite appropriately. It is a huge, ice-cold shop that specializes in meat and they will package and deep-freeze it for you. We bought lots of stuff – lamb, chicken, beef – and loaded it into the freezer on the boat – it will be nice to have when we are in places like Vanuatu where I suspect the quality of meat will not be what it is here. Besides groceries we had a small list of other essentials that we had to pick up – new pillows, a couple of new towels – just minor things. The boat is really very well supplied now. We also bought beer and wine – more than we would ever drink in a lifetime at home – but very little compared to what other cruisers seem to keep on their boats, There are limits on how much alcohol you are supposed to bring into Fiji and all of us are breaking the rules – I think they allow 6 liters of wine in all which is pretty paltry when you consider that most boats will be hanging around for months. Anyways, we are all set in terms of food etc. In addition to the boat provisioning there were several critical boat issues which needed to be attended to – all Mark’s domain – including installing a new VHF radio, an AIS system (see Mark’s blog), new sails, waterproofing seals on all external lockers, re-attaching back-stays, adjusting the new sails, removing a light fixture that was broken (this involved me taking Mark up the mast 4 times). The boat was also in desperate need of cleaning, but we only did the most basic cleaning as we were too busy to do more. I guess that is one thing I can take care of while we await a new weather window. All of our encounters with the Kiwis this past week have been so pleasant. The shopkeepers here are friendly in a very different way than at home – they seem a little gruff – but invariably go out of their way to make sure you get what you want. Half the time I am not quite sure I have even understood what they have said, and I am sure they must have the same issues with our English. The accents are incredible. Carl is Cal, eighteen is eye-deen, bread is breed… it is a lot of fun. Island and then approximately 350 degrees magnetic to Fiji. where we are. The weather is calm and the forecast is excellent. We will try to send regular updates. We have been so busy getting the boat and ourselves ready to sail that there has been no time to write. We are trying to leave with tomorrow’s high tide or else we will have to stay 5 more days in Whangarei waiting for a daytime high tide. There is a terrific weather window right now that has resulted in many cruisers leaving New Zealand for places north. The Vera’s and the Risho Maru’s are both leaving for the tropics tomorrow and we think we may join. The tentative plan is to get to the mouth of the tidal river by tomorrow evening and anchor out in Urquhart’s Bay. On Thursday, we can checkout of New Zealand at Marsden’s Point, then return to Urquhart’s Bay to make final preparations, and then leave for Lautoka, Fiji either Thursday evening or Friday morning. It should be about an eight day sail. We will write tomorrow with more definite plans. The Risho Maru’s are going directly to New Caledonia so we will not see them again until late June in Vanuatu. 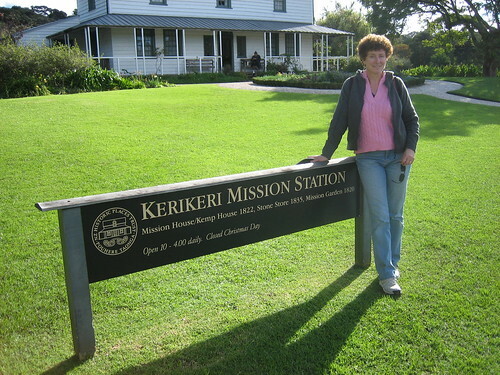 The Vera’s are going to Fiji and we expect to spend some time with them there. M.
We left from the Providence airport for New Zealand on Monday morning, May 5th. Our good friend Robin Ringer picked us up from our comfortable sabbatical house at 20 Cooke Street along with our eleven bags. Luckily, she has a huge SUV otherwise everything would not fit. The photo below shows us outside T.F. Green airport with the seven large duffels that we checked-in. Check-in was a lengthy but not difficult process. They charged us $88 per extra bag all the way to Auckland, as we had been told. Quite a bargain. We had a four hour layover in Chicago and Hannah took the airport bus from Evanston to see us. We had lunch at the airport Hilton and then sat in the sun beneath the control tower. It was the fifth time we were able to see her since our return. It was so nice to just be with her for a few hours. We only wish Ben could have been there too. The next leg took us to LA before the 12 hour + Air New Zealand flight to Auckland. We did manage a few hours of sleep on the flight and arrived at 5:30 am in a reasonably coherent state of mind. 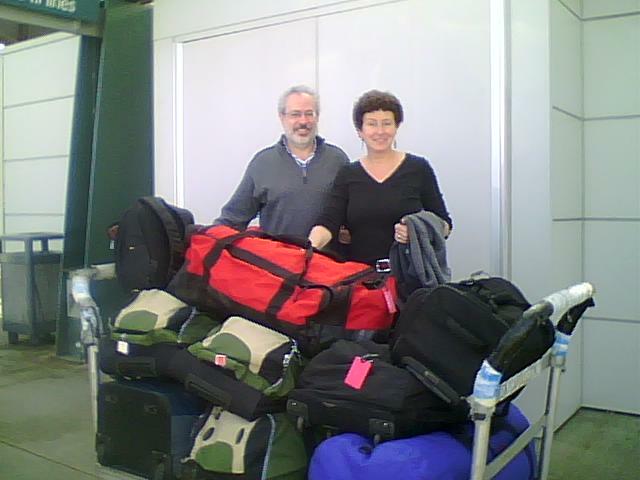 We were prepared for some trouble at customs since normal tourists do not travel with nearly 450 pounds of baggage. On the customs form, I check both the “yes” and the “no” box on whether we had more than $700 of possessions, figuring that would cover all the bases. The customs guy looked at our piles of stuff and waved us through. Our rented Toyota Camry had just enough room for everything once we moved the front seats all the way up. We headed out into rush hour traffic until we came to a distant suburb and stopped for breakfast. The weather was great – sunny skies and temperature in the 60’s. The past two weeks had been stormy on the North Island so we were quite lucky. The drive up to Whangarei was beautiful. Everything was green and lush with only a few traces of the impending winter. When we arrived at Riverside Drive Marina we were happy to see that our boat was in the water. It had just gone in that morning (Wednesday, May 7). The bad weather had kept all the boats in the water pinned to the dock so there was no room for us until just that morning. With the weather change, a lot of boats took off north (including our friends on Risho Maru), leaving room for new boats to enter the water. Sabbatical III looked good but there was a bit of mildew down below in spite of our friend Bo’s regular airing of the boat. Fortunately, it was high tide so dragging our bags to the boat was a bit easier than it could have been. At high tide the car-park and the dock are at the same level. At low tide, it is a steep drop to the dock. In the middle of this process, Michael and Britta of Vera came over from Town Basin, where Vera lies, to greet us and help with the last bags. It was so nice to see them again and begin to catch up on news. Vera had also been stuck on the “hard” by bad weather and was put back in the water just that morning too. She was hauled only to get anti-fouling paint applied to her hull but the rain made it a two week long ordeal. 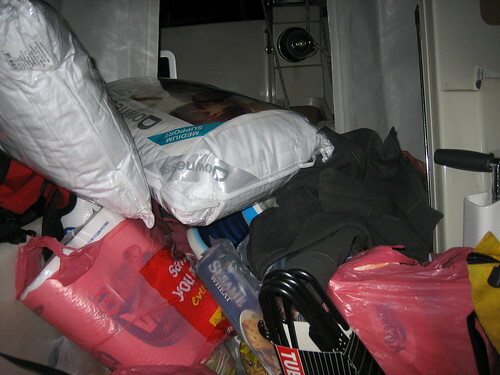 In spite of our fatigue, Laura and I emptied our bags into various piles inside the boat. Only our sleeping berth was not completely covered in stuff. The Vera’s then treated us to a nice meal at an Indian restaurant in town. 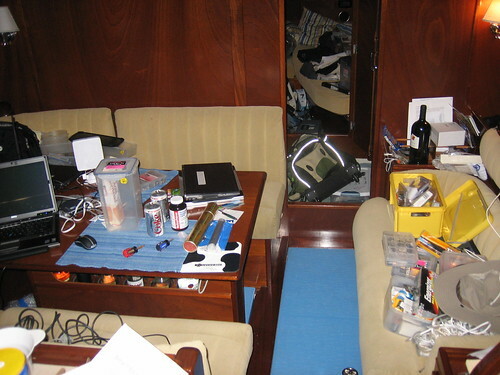 The inside of the boat is still a mess as I write this (Sunday May 11), but now the piles are more sensibly sorted by type of stuff. We have actually moved along fairly quickly with our preparations to head north. There were light winds yesterday, so Dave Parr (“Waldo”) of Calibre Sails, our sailmaker, came over to put up our new sails. They are clean and white and crinkle in the breeze. With some help from Michael and Britta, I installed our new AIS (Automatic Identification System) and was able to get AIS data and GPS/depth/wind data from our Raymarine Seatalk network to be understood and displayed on our laptop. We are well connected to the outside world here. We bought a SIM for our cell phone at the airport which has proved very useful. 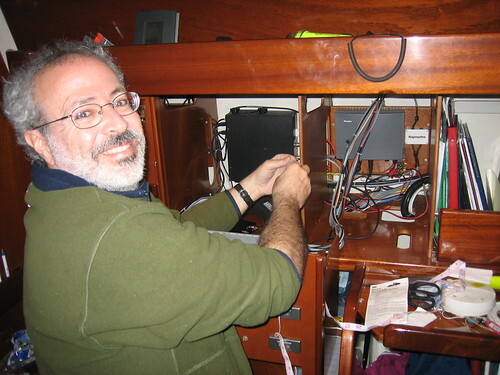 I set up our new directional wireless antenna and wireless router so that we now have excellent access to the internet plus our own inside-the-boat network. The other projects we completed in the past two days include putting new weather seals on all the outside lockers, reattaching our backstays, and replacing our VHF radio handset with one we bought in the US. We have heaps of food, wine, and engine oil that still need to be put away and more shopping to do, plus some more boat projects. We may be able to finish on Wednesday. Then, if the weather cooperates, we will head north to Opua. Vera hopes to do the same. We probably could not reach Opua until Saturday. We can only leave Whangarei at high tide and on Thursday high tide is late in the afternoon. That gets us only to the opening of the river at Urquhart Bay. It would be difficult to get from there to Opua in one day especially with the short days of mid-May. Where to put all this?